alaTest has collected and analyzed 22 reviews of Villaware BVVLDCSL01. The average rating for this product is 4.0/5, compared to an average rating of 4.4/5 for other products in the same category for all reviews. Reviewers really like the reliability and price. The design and performance also get good comments, but some have doubts about the size and maintenance. There are some mixed reviews about the capacity. We analyzed user and expert ratings, product age and more factors. Compared to other products in the same category the Villaware BVVLDCSL01 is awarded an overall alaScore™ of 83/100 = Very good quality. I specifically wanted an unbreakable carafe. Permanent filter. Easy to disassemble to clean, then easy to reassemble. Rather large. Slow to pour. Weird it pours from a hole in the middle of the top of the carafe. The thermos carafe doesn't keep the coffee hot for quite as long as my old machine, but fine up to a couple of hours so no real complaints there. 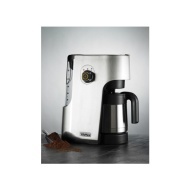 makes great coffee, stylish, good price. pouring could be easier but it's not a stopper, hotplate & vacuum flask? not sure you need both, can a hotplate even heat a vacuum flask? maybe I'm getting the wrong end of the stick.